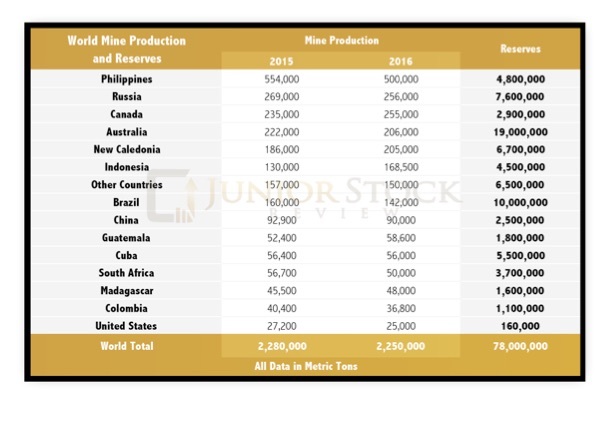 Brian Leni of the Junior Stock Review lays out key information for investors in this in-depth overview of the nickel market. First and foremost, the way to make money on a consistent basis in the junior mining sector is to buy quality. Chasing what is hot in the market typically means you are too late to the story. However, in my opinion, it’s still necessary to have a good idea of where the commodity is within the cycle, as buying near the bottom of the cycle will tilt the odds of success in your favour. Today, we’re going to look at a base metal market which has been beat up over the last few years, but may be on its way up. This metal is nickel, one of the most important metals of our industrial world. For the most part, nickel has been somewhat off the radar in the resource investment world; in the 4 years preceding 2016, the nickel market was over-supplied with nickel ore, sending the nickel price to 5 year lows under $4 USD/lbs. 2016 may have marked the bounce back in nickel prices for a number of reasons that we will get into later on in this report. Before we get into the supply and demand fundamentals, let’s take a look at some basic geological background information on the metal. In the U.S. Geological Survey’s(USGS) 2017 review, it states that the world has 78 million metric tons of nickel reserves and produced roughly 2.25 million metric tons of nickel ore in 2016. Nickel is most often found in two types of ores, sulfides or laterites. While nickel laterite ores are more commonly found in the world, they are mined less than nickel sulfide ores, which make up the vast majority of current and historical production. Laterites are formed near surface, typically in tropical regions, where high rainfall and higher temperatures have released the nickel from ultramafic rocks, forming highly leached soils. Laterite deposits are commonly found around the equator, for example the Philippines, Indonesia, Western Australia and southern Africa. Nickel laterite ores are mined less often than sulfide ores because they require more extensive and more complicated processing to extract the nickel. Higher cost of production means these deposits typically sit and wait for higher nickel prices to make them economic. Nickel sulfide ores are associated with ultramafic rocks, which sit near the surface. It’s theorized that during formation, ultramafic flows picked up sulphur droplets from adjacent rock. As the sulphur droplets moved through the ultramafic flow, they collected nickel, copper and other platinum group metals. Thus, we’re left today with nickel sulphide deposits that commonly have these other metal types. I had the chance to ask FPX Nickel CEO, Martin Turenne, a series of questions pertaining to the global nickel market. Highlights from our interview will be shared throughout the report. FPX Nickel is developing its flagship Decar nickel project, located in central British Columbia, Canada. The Decar project is a greenfield discovery of nickel mineralization in the form of a naturally occurring nickel-iron alloy called awaruite. Nickel ore is mined all across the world, however, the majority of current production is concentrated in a few keys areas: the Philippines, Russia, Canada, Australia, New Caledonia and Indonesia. As a country, the Philippines represents roughly 20% of the world’s nickel production. Rewinding back to 2013, global nickel production looked much different, as Indonesia was the largest producer in the world, representing an overwhelming 34% of the market. However, this changed very quickly in 2014. Why did Indonesia’s production fall in 2014? In a nutshell, the Indonesian government instituted a ban on nickel ore exports in an effort to encourage investment in downstream nickel ore smelting operations. Prior to 2014, China, the largest importer of Indonesian nickel ore, would ship the raw nickel ore back to its smelters, where it would be processed into nickel pig iron (NPI). NPI is a ferronickel product, the creation of which is credited to China, and it can be used in the making of stainless steel. Stainless steel producers have a choice between using NPI or pure nickel in their process, however, NPI is typically a cheaper alternative. NPI is created using low grade, laterite nickel ores which are mixed with coking coal and a mixture of fluxes. The process culminates in a blast furnace, which renders the unwanted impurities into slag and allows the molten mixture to be cast into molds, forming nickel pig iron. While the Chinese provided Indonesia’s nickel mines with steady demand for the ore, the Indonesian government wanted more from the industry and, thus, in 2014 issued a ban on the exporting of nickel ore.
To date, it would appear that this ban hasn’t worked out as well as the Indonesian government would have hoped, as earlier this year they relaxed their stance on nickel ore exports, saying that some approved, low grade (less than 1.7% Ni content) nickel ores could be released into the market, provided the buyer expresses a commitment to build a smelting operation in Indonesia within five years. In your opinion, will the Indonesian government further relax or lift their nickel ore export ban and how will that affect the global nickel market? Martin: If the Indonesian government wants to encourage greater investment in domestic smelting capacity, it will not further relax or lift the export ban. When the export ban was relaxed earlier this year, the nickel price dropped; the Indonesian Smelter Association has since reported the closure of 13 out of 25 Indonesian nickel pig iron (“NPI”) smelters due to low nickel prices. So relaxing the ban has defeated the purpose of its initial implementation, which was to encourage investment in new smelter capacity. The relaxation of the export ban has actually had a relatively neutral impact on global nickel supply this year; to the extent the ban is further relaxed, any increase in Chinese NPI production is largely offset by lower Indonesian NPI production, and this limits the potential for further development of Indonesian NPI smelters going forward. I don’t think it should come as a surprise to anyone that the environment and how we live in it is becoming a larger political issue around the world with each passing day. A large segment of the population is demanding both industry and individuals reduce their impact on the environment, mainly via reducing carbon emissions. The Paris Accord and the 450 Scenario are two examples of organized attempts to bring countries together in addressing our impact to the environment. While many countries have embraced these hefty goals for carbon emissions, there are still countries that choose not to conform to the trend, as well as others who are walking to the beat of their own drum by setting their own goals and plans to achieve them. China has long been associated with poor air quality in its cities, an unfortunate trade-off for the country’s massive manufacturing industry. This trade-off has long been accepted, but this sentiment is quickly changing, as the Chinese government has begun to target industries that contribute significantly to air pollution, forcing them to shut down or improve their process. Earlier this year, I wrote about the effect this has had on China’s zinc smelting operations and how that loss of smelting capacity has further contributed to the supply crunch in the zinc market. Nickel is no different, as, most notably, the Philippines are shutting or suspending nickel operations in an effort to reduce the industry’s affect on the environment. Philippine Ban on Nickel Ore Exports? This would have major implications on the nickel market if it becomes official policy. As stated earlier, the Philippine government had already started to suspend and shut down mining operations due to their affect on the environment. Taking it a massive step forward is incorporating a ban on the export of unprocessed ore.
We need to keep a close eye on this, because in my mind, this makes the nickel narrative very bullish. Brian: In what appears to be a growing trend, the Philippines have ordered the suspension or closure of roughly 50% of their nickel producing mines due to environmental concerns. In your opinion, will the environment continue to play a role in the global nickel market moving forward, or are the actions by the Philippine government an isolated situation? 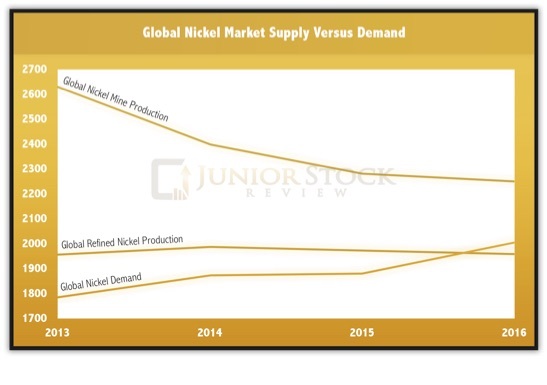 If this is just the tip of the iceberg, how do you foresee it affecting future nickel supply? Martin: The environmental factor could be significant going forward, because mining practices in the Philippines can be pretty gruesome for the local ecosystem, and the move to suspend operations has very vocal support from Filipino President Duterte and local populations. Beyond that, we have recently started to see some curtailing of NPI smelting operations in China, which are very dirty operations. Given China’s current crackdowns on polluting industries, and given that the country has capacity to produce up to 20-25% of global refined nickel supply, smelter shutdowns there are significant for the market. Two companies stand above the rest when it comes to world nickel production, Vale and Norilsk Nickel. Combined, they control more than a quarter of the nickel produced in the world, let’s take a look at these two companies. Vale is a major resource company with a variety of different areas of business: mining, logistics, energy and steelmaking. While they have multiple cash flow sources, they are primarily a mining company. As a mining company, they have operations that mine iron ore, nickel, coal, copper, fertilizers and manganese/ ferro-alloys. Currently, Vale is the largest producer of nickel ore, with 14% of the global market. Vale’s nickel operations are in Brazil, Canada, Indonesia and New Caledonia. Also, Vale is a refiner with both fully owned and joint venture operations in China, South Korea, Japan, the United Kingdom and Taiwan. One of Vale’s largest footprints is in Canada with offices or mining operations in the following cities: Toronto, Sudbury, Port Colborne, Thompson, St. John’s, Voisey’s Bay and Long Harbour. Vale’s Sudbury location employs roughly 4000 people and is one of their largest properties with six mines, a mill, a smelter, and a refinery. Along with nickel, the mines also produce copper, cobalt, platinum group metals, gold and silver. Norilsk is a Russian company and the 2nd largest nickel producer in the world. As their name would suggest, nickel is their primary focus, however, they do produce a number of other metals, including: palladium, platinum, copper, cobalt, rhodium, silver, gold, iridium, ruthenium, selenium, tellurium and sulphur. Polar Division – Located in Russia, north of Arctic Circle. The Polar Division has 4 mines which produce sulfide copper-nickel ores. Kola MMC – Located in Russia, near the border with Norway and Finland. Kola has sulfide disseminated ores mainly containing nickel and copper. The ore is then processed into a collective copper-nickel concentrate. Kola’s refining facilities can then create electrolyte nickel and copper, carbonyl nickel, cobalt concentrate and precious metals concentrates. Norilsk Nickel Finland – Located in Finland, it is the only refining plant in the country. The refinery processes nickel concentrates from Norilsk’s other operations. Norilsk Nickel Australia – Operations are currently suspended. Norilsk Nickel Africa – 85% ownership of Tati Nickel Mining Company in Botswana and 50% ownership in Nkomati in South Africa. Brian: The major mining companies are typically a great gauge for the supply and demand fundamentals in their given sector. In your opinion, from the information they are disseminating, where is the nickel market currently and where is it headed? Martin: In terms of market fundamentals, all the analysts and the major companies are aligned in predicting supply deficits for the next several years and rising nickel prices. You just have to look at the deficit forecasts recently disclosed by Norilsk and Sumitomo Metal Mining, to name just two. We are also seeing companies like Glencore and BHP very publicly highlighting the growth in nickel demand from electric vehicle batteries, and the hugely bullish implications of that for the nickel price. Finally, we are starting to see majors starting to look for growth opportunities for their nickel businesses; that’s a common theme we hear when speaking to those companies and to investment bankers in the industry. As the nickel price continues to strengthen, that urgency to acquire new projects will pick up considerably. Brian: Mines are depleting assets and, therefore, regardless of where we are in the bull or bear cycle, the major mining companies, when push comes to shove, have to replenish their coffers with more pounds or ounces of metal on a continuous basis. Roughly, 60% of the world’s nickel production is from major mining companies, which, in my mind, means that good nickel deposits are typically bought up in the market by the majors versus being developed by the junior that discovers them. How close and what do you believe will be the catalyst for the next merger and acquisition rush in the nickel sector? Please explain. Martin: Just one year ago at this time, mid-tier and major companies in base and diversified metals were still focused on repairing their balance sheets and in divesting non-core assets; growth wasn’t on their radar at all. With the subsequent run in the prices of base metals and bulks, those same companies are now generally very profitable again, and given that their pipeline of new projects is relatively empty, they are actively seeking growth opportunities and looking to add new development projects to their portfolio. We’ve started to see a few mid-tiers and majors investing into copper and zinc projects, and I would expect you will see them looking to add nickel assets into their portfolio next. The fact that there’s been so little investment in base metal projects in the past few years bodes extremely well for companies like FPX Nickel – companies with large, low-cost development-stage assets located in attractive jurisdictions. Existing and newly approved nickel mining operations are projected to show an average yearly increase of roughly 440,000 tonnes of production leading up to 2020. Let’s take a look at a few of the largest contributors by country. Indonesia is set to have the largest yearly increase in production with an average of roughly 258,000 tonnes of laterite ore over the next 4 years. Indonesia’s expected production increase is directly related to the low-grade ore which will exported. Guatemala’s Fenix Mine is projected to show an average yearly increase of 27,000 tonnes of laterite ore over the next 4 years. The Fenix Mine was reopened in 2014 after 30 years of closure due to disputes over land ownership. Finland’s Talvivaara (Sotkamo) and Kevitsa Mines are set to increase yearly production on average by 25,800 tonnes of sulphide ore over the next 4 years. The Talvivaara Mine will show the bulk of the increase in production. It is located in Sotkamo, and is mined by Talvivaara Mining Company, a company which has had its share of issues, including bankruptcy in 2014 and a tailings spill. The company has since signed a 10 year deal with Norilsk Nickel, which will buy all of its nickel and cobalt production over the contract period. Australia’s Nova-Bollinger Mine is projected to increase its average yearly production by 20,400 tonnes of sulphide ore over the next 4 years. The Nova-Bollinger Mine is owned and operated by Independence Group, which is an ASX listed diversified mining, development and exploration company. A decline in the yearly production of currently producing nickel mines is projected to average 270,000 tonnes leading up to 2020. Here’s a look at some of the larger reductions in nickel production from around the world. Australia’s Long and Savannah Mines are expected to decrease their yearly production by a combined average of roughly 10,000 tonnes until 2019 and 2020 where that will double to 20,000 tonnes. The Long mine is owned and operated by Independence Group, which purchased the project in 2002 from BHP. The Savannah Nickel & Cobalt Mine is owned and operated by Panoramic Resources. All of the mineral concentrate produced by the Savannah mine is contractually sold to Jinchuan Group, one of the world’s largest nickel companies. Brazil’s Mirabela and Niquel Tocantins Mines’ yearly production is expected to decrease by a combined 46,000 tonnes per year leading up to 2020. Guatemala’s Montufar – Garnierite Mine is expected to decrease its average yearly production by 20,000 tonnes over the next 4 years. Subtracting the projected decreases to increases in production, by 2020, the yearly available supply should roughly increase by 174,000 tonnes. However, a major wild card in this estimate is the actions by the Filipino and Indonesian governments. They hold a lot of influence on the future supply numbers, positive or negative. When examining the supply numbers for any of the industrial metals, it’s important to check the inventory levels held by the London Metal Exchange (LME), Shanghai Futures Exchange (SHFE) and bonded warehouses. For those who aren’t aware, the LME is a major world centre for the trading of futures contracts in industrial metals. Established in 1877, the LME has a long history in the metals industry and, thus, has a great network of warehouses around the world. The SHFE is Asia’s answer to the LME, as it allows for futures contracts trading of a number of different commodities, which include: gold, silver, copper, aluminum, nickel, steel rebar, zinc, etc. While not being as old as the LME, the SHFE has become a major part of the global market, one that needs to be considered when researching any commodity. Examining the total global nickel inventory, you see that they are down 15% from the April 2016 peak, and down 10% year-to-date in 2017. Currently, total global inventories sit just below 500,000 tons. (Source: ScotiaBank and RBC Capital Markets) Contrasting this against 2016 production levels, which were 2.25 million tons, the current total global inventory represents roughly 22% or 3 months of annual production. To note, the LME nickel supply makes up roughly 80% of the total global nickel inventory. For those interested, the LME inventory data is readily available on their site or on the Kitco site. The LME’s nickel 5 year stock level chart shows that since 2012, nickel inventories have grown from just over 100,000 tons to a high in 2015 of roughly 450,000 tons. However, since 2015, these stock levels have fallen down below 400,000 tons. Brian: LME nickel inventory levels have trended downwards after hitting a 5 year high in 2015. Current LME nickel inventory is sitting just below 400,000 tons, which is roughly 18% of 2016 world nickel production. How much influence does the LME inventory supply have on the nickel price? Secondly, is there a key inventory level which can be looked at as critical to its influence on the nickel market? Martin: Global reported inventories do have a big influence, and we are a ways off from reaching a critical level in terms of perceived tightness in nickel inventories. I think the important takeaway is that global reported inventory levels are down 15% from the peak in April 2016, which reflects the supply deficit in 2016 and 2017; so we have some very positive momentum in inventory draw downs and spot price escalation. More importantly, the analyst consensus is for more severe supply deficits over the next several years, which is the fundamental driver for an increase in prices going forward. Among the major metals, nickel has by far the most upside from the current spot price; the long-term consensus forecast price is around $7.50/lb, which means the price has to go up 45% to reach a stable long-term equilibrium, whereas the current spot price for copper and zinc is already at or above the long-term consensus forecast level. If you’re looking for the base metal with the most upside, nickel is the choice. Like all commodities markets, the supply fundamentals of any particular metal are complicated, not only from a quantitative perspective, but also because these markets are so large and widespread. Their size and geography leave them very susceptible to the jurisdictional risk that we all stress about when investing in individual mining companies. 2016 marked the first year in the last 5 where the nickel supply was out-stripped by demand. Major nickel producers believe that we will see continued supply deficits and a rising nickel price over the next few years. The Indonesian partial ban on nickel exports should continue as the country looks to develop its smelting industry. The Philippines have suspended or closed roughly 50% of its annual nickel production due to environmental concerns. In 2016, the Philippines were the world’s largest nickel producer, given the current direction of government policy, this may not be the case in 2017. Subtracting the projected decreases to increases in nickel production, by 2020, the yearly available supply should roughly increase by 174,000 tonnes. The Philippines and Indonesia are wild cards in this projection. Total global nickel inventories are trending downwards, falling 15% to below 500,000 tonnes, since hitting a high in April of 2016. The Philippines and Indonesian will have a major impact on the direction of the nickel price. If things remain status quo, it would appear that the nickel supply should continue to get out-stripped by demand. However, we have only covered only one component of the equation; we need to look at nickel demand. What does the nickel demand look like, currently? From there, we can make some conclusions about where we think the market is headed. Stay tuned! Disclaimer: The following is not an investment recommendation, it is an investment idea. I am not a certified investment professional, nor do I know you and your individual investment needs. Please perform your own due diligence to decide whether this is a company(s) and sector that is best suited for your personal investment criteria. Junior Stock Review does not guarantee the accuracy of any of the analytics used in this report. I do own FPX Nickel Corp. shares. I have NOT been compensated to write this article. About the author — Junior Stock Review provides investors with in-depth analysis of junior resource companies and interviews with key players from the industry. It’s also a platform through which its founder, Brian Leni, discusses where it is that he’s investing his money, and the people who have and do influence the way he looks for opportunity in the market. Brian is a Professional Engineer by trade, and worked in heavy industry for over 10 years. As a process engineer and then a manager of the steel rolling process, Brian honed analytical skills that lend themselves very well to the world of investing and speculation.